Bethany Vanderputten is an artist and illustrator originally from Calgary, Canada. Bethany recently received her MFA in Illustration from Academy of Art University in San Francisco. Bethay's work will be shown for the first time at Gallery 688, located at 688 Sutter Street, San Francisco, July 1 - 29, 2010. The title of her show is "Faithful." Bethany's art is inspired by her love of travel and adventure, music (she sings and plays piano), heroic stories and quotations from literature and poetry. 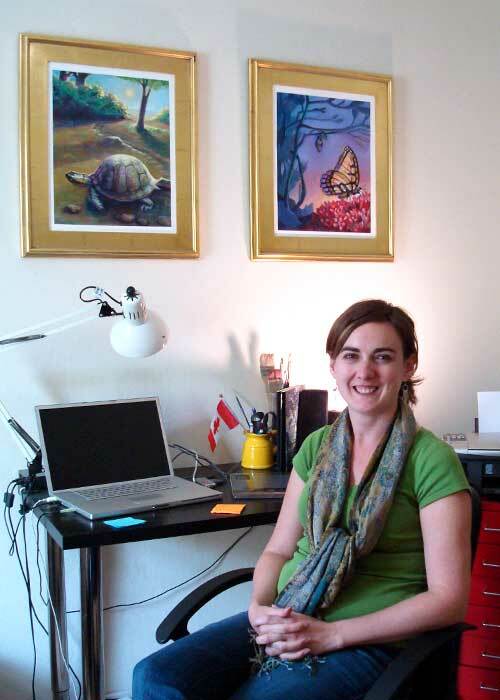 Bethany recently launched her own business, Bethany Vanderputten Illustration & Fine Art. When I met Bethany, she gave me a postcard for her upcoming art show. I immediately fell in love with the image on the card, from her painting "A Butterfly's Adventure." I wanted to see more of her work and learn more about her. Bethany graciously invited me to her downtown San Francisco art studio for a sneak preview of her upcoming art show. I was very excited to see her paintings up close, and to learn more about her life and creative process. What led you here to San Francisco to Academy of Art University? I did my bachelors degree in Calgary, in Visual Communications. I enjoyed that . . . but after doing [graphic design] for a few years, I got really tired of being on the computer. When I was a kid, I really wanted to illustrate children's books. And I never really explored that dream. So I decided that I need to pursue this, and stop doing things I'm not as passionate about. I applied to Academy of Art University because they had an Illustration Masters degree. The city (San Francisco) really inspires me. What have you learned through your MFA program at Academy of Art University? I learned what type of art I wanted to do. I knew I wanted to illustrate children's books, but I thought illustration was all about cartooning or doing something fantastic with made-up imagery. I didn't realize that there is this whole realistic side of illustration art, and that is what I am better at. So just finding that, and honing my own voice, I could only have done at Academy of Art University. They taught me a lot of techniques and how the Renaissance artists painted. And how to explore your own reactions to text. That's probably the biggest thing I learned, is how I wanted to express my own ideas, and not how someone else did it. Illustration is its own art form and it's a response to another idea or another concept, or a way to show that visually. It needs to be not just beautiful, but communicative. That's something I've been exploring a lot. That's part of my personality too . . . I'm not an American. Americans are very direct people and they'll state something very clearly. I'm not like that. Canadians are . . . more nuanced. I realized that's how I paint. I have comparisons, or I paint something but I'm thinking about something else at the same time. So that comes out in how I paint. And there are all these ideas that aren't necessarily clear. So are they clear to you in your mind, or is it something you're exploring in your art? I'm exploring it as I'm painting. Bethany shows me an example of a painting she's working on for a Jack Johnson tour poster competition. The theme is "To the Sea". 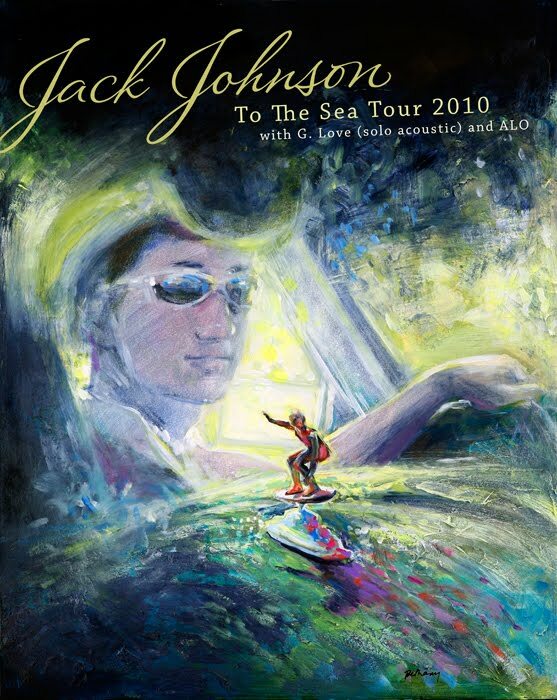 It's about a dad and his son going to the water to surf. But it's more about the water being your subconscious than anything, than actually being literally water. So it's an abstract concept, right? So how do you say that clearly? Something I was thinking about was delving into your unconscious mind, and what do you think about when you're in the water? The surfer, too, I'm thinking about the focus of his mind, where he's coming from. Maybe there's understanding coming to him as he's surfing. So this is a surfer, but it's a dashboard figurine. So it is a surfer, but it's not. It's a figurine, but it's not. So that kind of played between reality and something else. It's not clear, right? All these other things are going on with it. I love that. It's nuance, it could mean this or it could mean that. I'm exploring those ideas in my painting. When I paint I look at quotes. There's this Robert Browning quote that says "set free the imprisoned splendor." So, having an inner idea, that's in there somewhere, and how do you break it open? Sometimes I look back at something I've done and I think, wow, that reminds me of something, but at the time I didn't think of it consciously. I like art like that, that you really have to spend time with, and it could have multiple meanings, and it can grow with you too. It reflects what you bring to it, too. I don't know where I fit in the field of illustration or fine art, because of that. I'm not very literal. I feel like I'm more on the fine arts side, where I'm trying to explore a whole bunch of things at once. Among my favorite historic artists are Mary Cassatt, Rembrandt and Paul Gauguin. I'm also really inspired by recent art including the mewithoutyou album artwork by Tooth & Nail Records, Chris Buzelli's recent illustration work for Macy's Flower Show and the lovely Hawaii-themed posters by Kerne Erickson. I never know when and where I'll see great art so I try to keep my eyes open. I love the colors you use in your art. Tell me about your approach to color. I love color . . . it's how I see life, too. There's so much to explore. I'm an adventurer at heart, so I really like to look at things and find new places and new experiences. That's part of what I really like about painting from life, is that the more you stare at something, the more you see. A lot of times the more I stare at something the more colors I see. How did you choose your subjects for your thesis project? I want to be an illustrator that does a variety of things, so I chose three different markets for my work (book publishing, music publishing, and greeting cards) and reflected that in my thesis. My thesis work will be available through my show in July. What else would you like to share, about your art? "Expressive art to capture the heart"
I love it! Tell me what it means to you. I really want to engage people in a way that captures them. Because I am trying to tell a story through my art, sometimes you have to look at it for awhile to get it. I also really believe that because we're so online and virtual now . . . you see image after image, and how do you see something that makes you want to remember it? That's what I am exploring through different techniques, through my tactile painting, or texture, or color: capturing someone's heart through what they see, by expressing my own heart. "Faithful" paintings by Bethany Vanderputten will be shown at Gallery 688, located at 688 Sutter Street, San Francisco, California 94108 from Thursday, July 1 through Thursday, July 29th. Please come and meet Bethany at the opening. She is as lovely and inspirational as her art! welcome to Artists Up Rising! Scroll down to "Artists and Exhibitions" to see the full list of articles. Artist Writer Teacher in San Francisco, California and Phoenix, Arizona USA. Email me at rosaphoenix @ gmail.com. "Calder to Warhol: Introducing the Fisher Collection"
"Dark Matters: Artists See the Impossible"
"Design for the Other 90%"
"Van Gogh, Gauguin, Cezanne and Beyond"
Unless otherwise noted, all content © 2010 - 2014 Rosa Phoenix. Please do not use any content without my permission.